How many times do you open and close your garage doors in one day? If you’re like our family, we do it on average about 8-10 times a day. It’s something you really don’t think much about, but these guys are crucial to our survival. Even when we are away on vacation our neighbor feeds the cat and that requires 4 times. All that wear and tear takes its toll, and the weather here in Michigan doesn’t help. Our garage doors were almost 25 years old. When you think about it, 25 years, opening and closing 10 times a day…well, I just checked on my calculator and that is almost 100,000 times someone has messed with our doors. That is crazy. So, here we are. 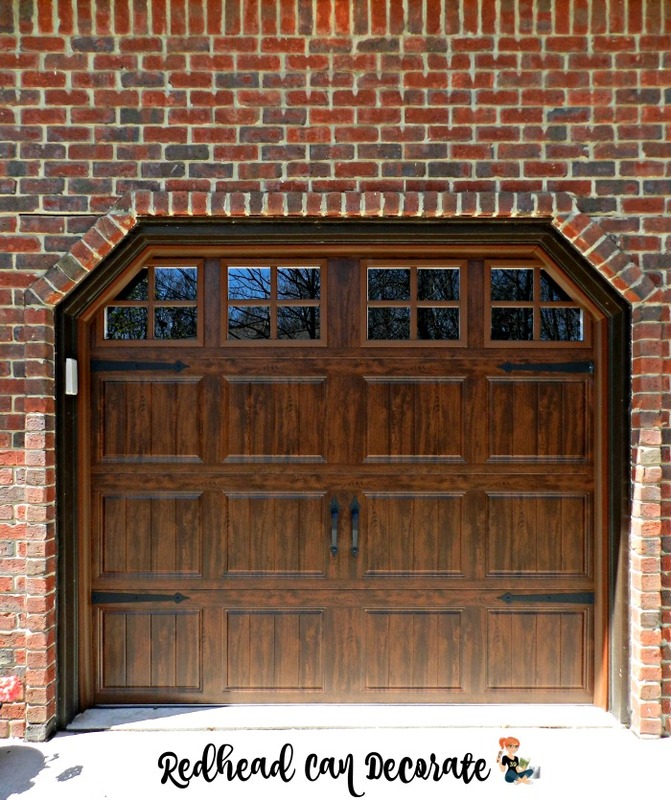 The day has come for new doors and I’m here to tell you “How to Replace Garage Doors”. It was way easier than I ever imagined. You may be wondering though, did we do it ourselves? Of course not. That would be insane. 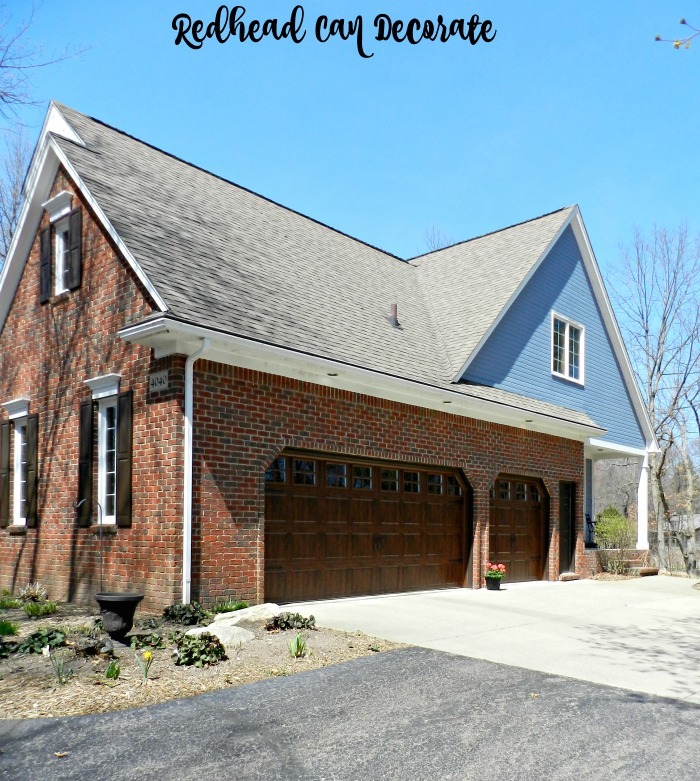 Here’s how we replaced our garage doors the easy way (if you need just a great garage door opener, that info. is below, too). Okay, so the before photo doesn’t really look that bad, does it? Seriously though, it was. Every single time we opened that big garage door I was afraid that bottom panel was going to fall off. In fact, a little piece did fall off every couple days. That entire garage door was falling apart from the inside out. The garage door opener was fine believe it or not. The small garage door had other issues. It didn’t even open anymore. 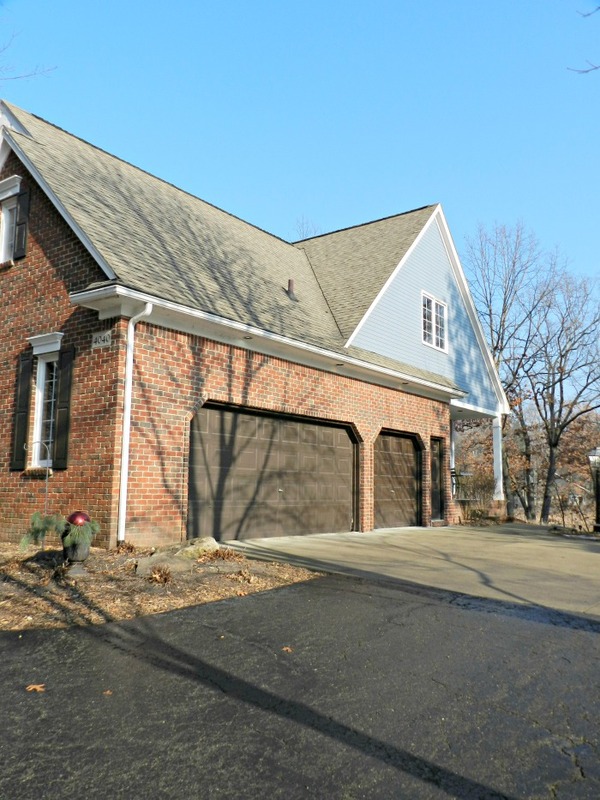 We ignored the garage door issues for quite a few years because we didn’t want to spend the money. 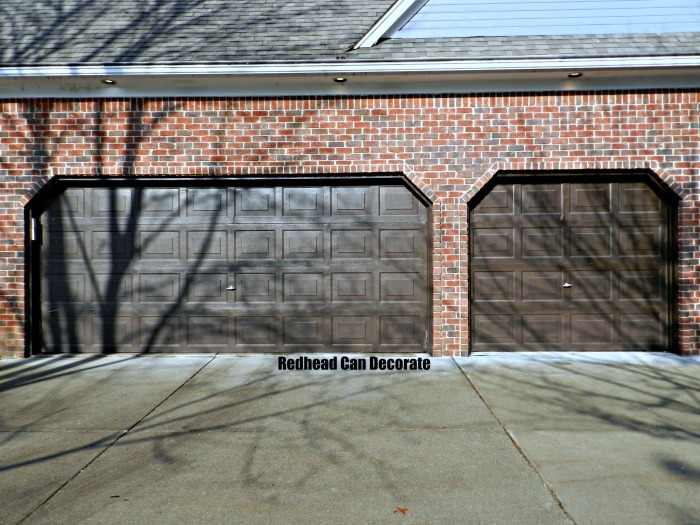 I mean, who wants to spend money on garage doors-blah!? Then we finally woke up and realized that if we were ever going to sell this house in the next couple years, we will definitely have no choice, but to replace both of these doors. So, why not do it now and enjoy the new doors while we are here? SMART. I can honestly say the new doors have made such a difference in our lives. We don’t worry about them falling apart every time we open them, and just look at those beauties. They are gorgeous. The day we got them our friendly neighbors sent us a nice message telling us how much they liked the new fabulous doors. Can we get a close-up, Redhead? And another side view. Pardon the landscaping it just warmed up here so things are hardly blooming in these photos. 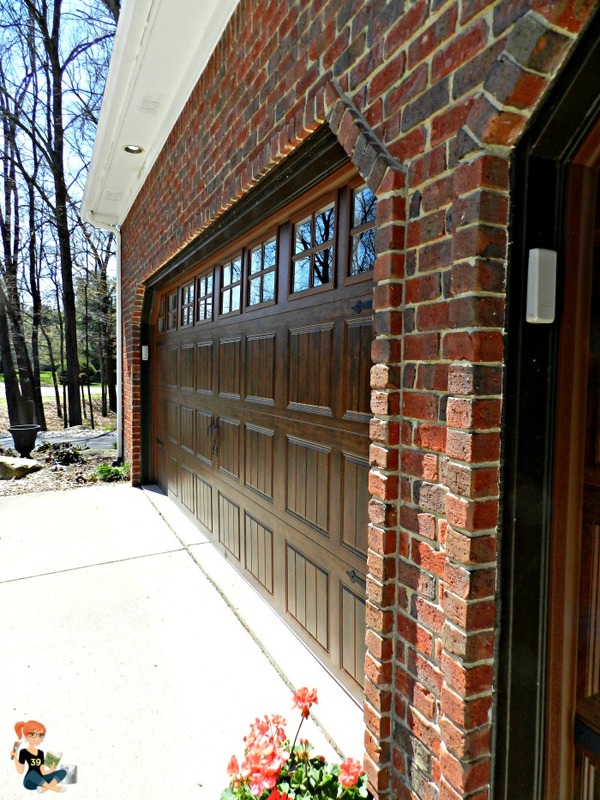 Here’s the small garage door and you can really get a look at the windows and “wood grain” even though these are not wood. Check out that cute hardware, too. One of the advantages to having windows in the doors is that it really brightens up the inside of our garage. Saves electricity, too. Okay, we’ve seen how much of a difference they make to our curb appeal and how they update the home instantly, but how did we do it??? Measure your garage door(s) width and height and jot it down. Decide if you need/want new garage door openers in addition to the doors. Call Home Depot for an appointment or walk in (like we did) and head over to the “door” section and there will be someone in charge over there. Let them know you want to purchase a new garage door(s). Home Depot will ask you many questions about your preferences and you will actually “design” your door(s) right then with their help. You will be choosing the design (Gallery Collection by Clopay), the color (the color we used is “Ultra Grain Oak Walnut Finish”), and if you want windows/hardware right then and there, so think about these things before you go. They will also be asking what grade of insulation you prefer. You will be able to see the costs in front of you, so you can adjust as necessary. We went with a higher insulation because of the Winter here in Michigan (I also paint out there often). Pay for the door(s), openers, and labor at this appointment, so they can set up an appointment to come out to measure, and so they can begin making your door(s). We chose to use our Home Depot credit card and pay no interest for 24 months. That way, I can pay a little each month and I pay it all off before that interest accrues (see total cost below). Home Depot will call the next business day or so to set up the measurement date. You will have to be home for them to measure, and they will need the garage door entrance area to be clear of all items so they can measure. We just parked our cars in the driveway and pushed everything to the back of the garage. Measuring only takes a couple minutes. They will call you in about 4-6 weeks when your door(s) is ready and set up the installation date. We only waited 4 weeks. Installation for both of our doors took 1/2 of a day. For some reason I pictured the door coming all in one piece ha ha, but it actually comes in panel sections and only 1 person came. There will be some cardboard boxes left over at the end that they do not take with them, however they do take the old door unless you want it. As mentioned above, we decided to use our Home Depot credit card with no interest for 24 months. After the bill comes, I divide the total cost by the months I have to pay it, and I make a note to pay that much every month, so I don’t get nailed at the end with a large scary payment. 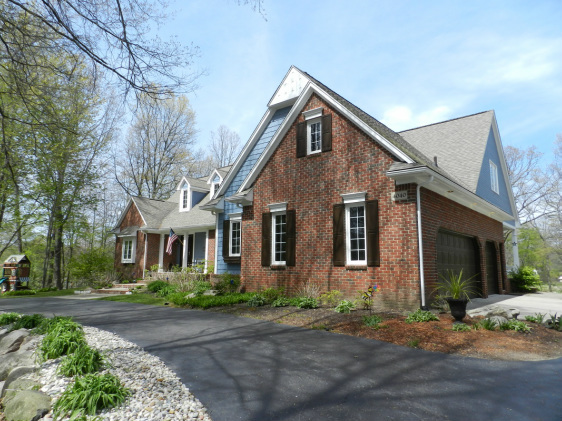 The total cost for the two doors, 1 garage door opener, and the installation came to $4092.06. 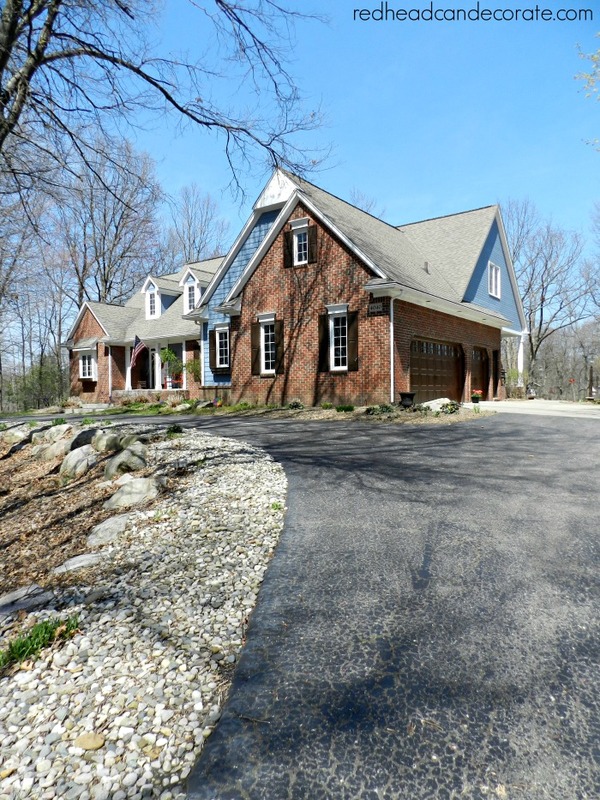 Keep in mind the color, windows, hardware, and insulation choices all determine the bottom line. For example if we opted not to get windows we would have saved about $700.00. Honestly though, I think they make the doors so much prettier. If you’re in need of a garage door opener only, this is the opener we purchased with the small garage door and I love it. It’s quiet, smooth, and the lights are very convenient. You can even control it from your phone! I totally recommend this garage door opener. Click here for complete information: GARAGE DOOR OPENER. 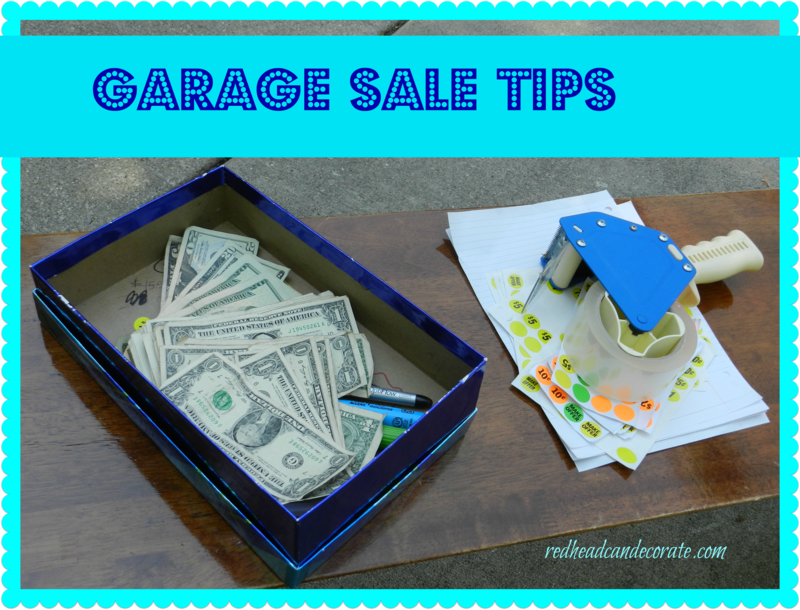 Click here for more garage tips! Dad, I knew you would like the windows! Those doors are so pretty. We actually have replacing ours on the list so this is helpful since I havent looked at pricing them for 15 years when I out the originally ones on. Hey Laura! They were great at Home Depot. I was very impressed with the entire process. placed some awful yellowed white fiberglass (YUK) doors. It made a much needed fresh clean view to the front of our home. Good morning Carol, You read me well. I have no idea how I will ever part with this place. It’s become part of me so it will be very very difficult. Hopefully where we go will keep me busy. I can focus on the bad parts, too. There are some bad parts I don’t talk about ? Gorgeous look and so helpful . 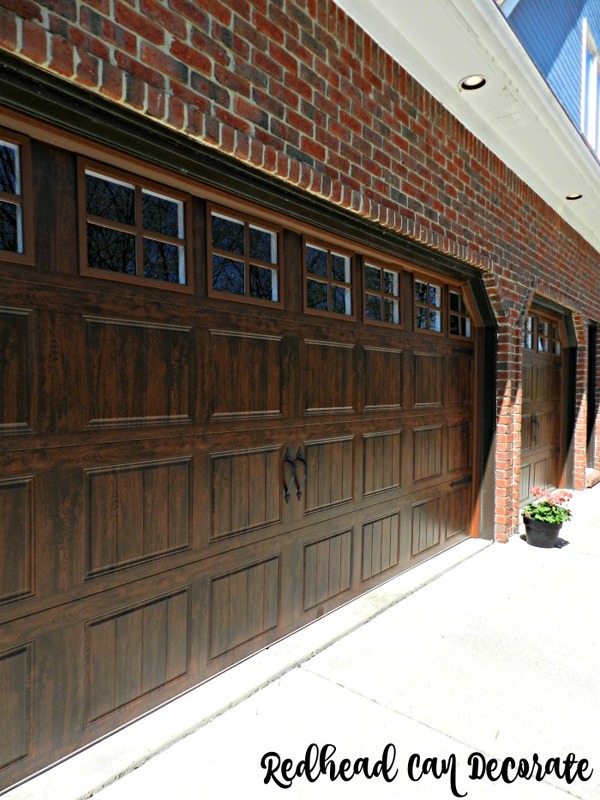 . . I’ve read where wood doors are heavy and have maintenance problems, so I was delighted to discover that we can get the wood look without the hassles. Hi Jan! That is very good to know. Never thought of that. Have a great weekend! Absolutely Stunning, Outstanding as well as Gorgeous. Made a world of difference. I really Like the wood grain look, as well as them windows; great choice on having windows. Makes for a very classy, rich looking to the front of your home. All blends well with your brick. Thank you, Colleen! I was thinking the faux wood would look too faux, but you are right! It blends right in and looks richer. Now if I could get rich ? They’re gorgeous Julie! Wise decision going with the windows and better grade of insulation. 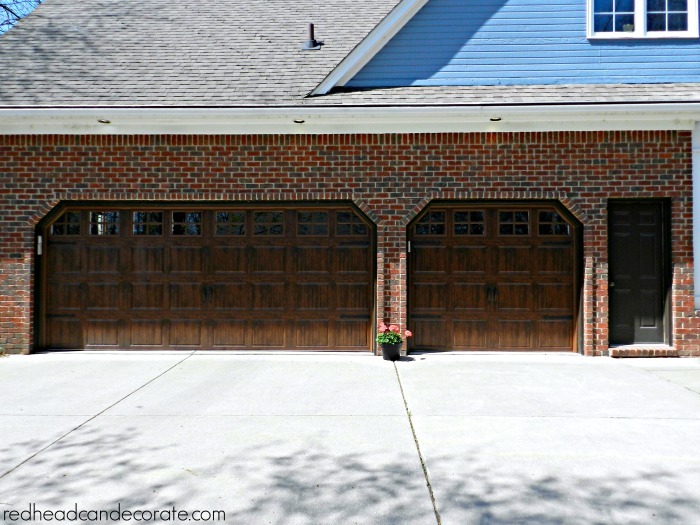 I love your garage doors! Did you also die or stain the driveway a lighter color? It looks so much whiter. Ho Roxann, That is a reslly great question! No we did not change anything with the driveway. The only difference is the time of day I took the photos and the temperature. The before photos were taken when it was cold, and the after photos were taken recently and it is warmer. Also, the before photos look wet? Very odd! Thanks for pointing this out. 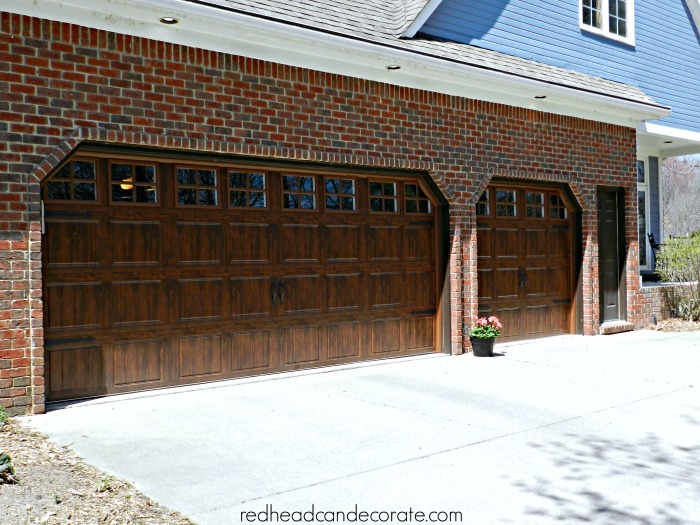 The garage doors are very pretty, but am surprised that you didn’t go with white doors since the rest of the trim on your house is white. Fabulous doors! I love, love, love them. Happy Sunday, Ivory! Thanks for stopping by ? I love the doors. What a nice look and I bet you have a bit more light inside the garage which is nice as well. WOW! They look amazing! That’s a dreaded item on my “TO DO” list as well, BUT your post actually just re-lit my fire to tackle that project (as all of your posts usually do). Thanks for the tips & enjoy the remainder of your weekend! Always think “resale value” even when it’s these big ticket priority items. The windows are added character to “great” looking doors. Fresh, rustic, and appealing!